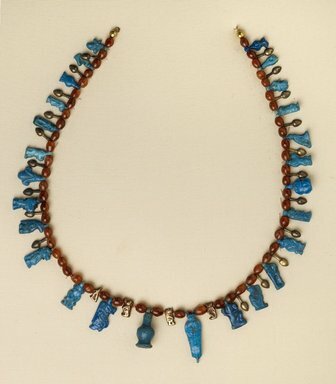 Necklace of carnelian beads with twenty hollow gold nefer pendants, twenty-six faience deity and floral motif beads, and in center, four small gold beads, three of which are in Taweret form, and one a Horus falcon. At each end globular gold bead (modern) with closed link. An assembled necklace.